In today’s Fantasy Findings, we talk about the return of a young stud and some sleeper picks that aren’t afraid to fire the puck. Connor McDavid went down to an unfortunate injury in the Edmonton Oilers’ game against the Philadelphia Flyers on Nov. 3. Before McDavid slid into the end boards in Philadelphia and broke his clavicle he had scored five goals and recorded 12 points in 13 games for the Oilers. Well, McDavid has picked up right where he left off. In the two games since his return, McDavid has scored one goal, a highlight-reel tally against the Columbus Blue Jackets in his first game back, and has tallied four assists. The Oilers in those two games are 2-0-0 and have outscored their opponents 12-3. Along with McDavid’s return is a spike in several Oilers’ fantasy value. “McDavid (92 percent owned in Yahoo) remains one of the most prized keeper-league assets in the game,” said Jensen and those that waited out the injury have been rewarded. Since returning, McDavid has spent most of his time on a line with Eberle and Benoit Pouliot. Pouliot has grabbed a goal and four points and Eberle has scored three goals and netted five points in those games. 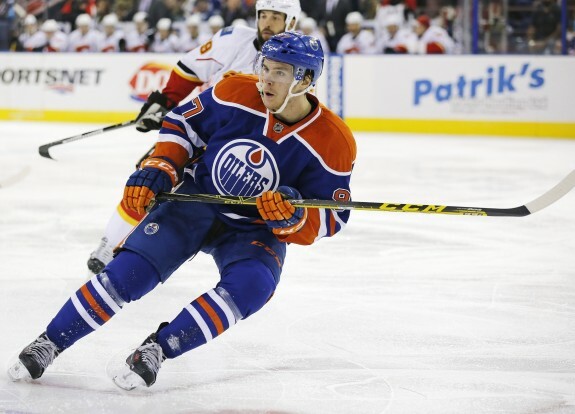 In the six games prior to McDavid’s return, Eberle had recorded just one goal while Pouliot had just two assists. So saying McDavid’s impact has been felt immediately is a large understatement. McDavid’s return will breathe life back into the Oilers not only on the ice and in the standings but in every aspect of fantasy hockey. The entire roster get’s better when the first overall pick from the 2015 Draft is in the lineup. The players that play beside him get better, the d-men on the blue line produce more and the goalie in the crease has a better chance at getting a ‘W’. From top to bottom this brings the Oilers back into fantasy relevance outside of Leon Draisaitl and Taylor Hall. Now is the time to go and grab players that will gain the most from McDavid’s return, like Eberle. Jensen says it best, “Don’t wait to swing a fantasy trade for Eberle, who has underwhelming numbers this season (22 points, five on the power play), a minus-11 and 77 SOG in 37 games.” Jump on Eberle while his value is low and ride the waves created by McDavid’s splash. You need to score to win and you need to shoot to score. It’s a simple process and there are some players in the NHL who shoot at ton. Alexander Ovechkin has taken 239 shots this season and Steve Ott has taken 21. You guess who has scored more goals. Now before you start throwing out arguments as to why that’s an unfair comparison let’s move along, that comparison isn’t why we’re here. We’re talking shots, something Mike Murphy talked about over at Today’s Slapshot. Murphy mentioned Nazem Kadri, Radim Vrabata and Jeff Skinner as sleeper picks when it comes to value based on shooting the puck. Let’s start with Kadri. Sure, Kadri is firing off shots at a semi-automatic speed. Kadri’s 187 shots and 11 goals in 50 games has grabbed him a 5.5 shooting percentage. Those numbers coupled with some other assets would make Kadri a fantasy stud, but it’s hard to get by on shots alone. That is why Kadri is too much of a risk. If there is a night where Kadri is shut down and can’t get a puck on net he’s almost worthless. That is why you should look to Skinner and Vrbata first if possible. Skinner has unloaded 147 shots on net and has found the back of the net 18 times which gives him a 12.2 shooting percentage. Vrbata has 11 goals on 166 shots this season which has given him a 6.6 shooting percentage. So both are already leading in the conversion category, which should be enough. But the biggest persuading factors should be the jerseys these players are wearing. Skinner and Vrbata are big pieces in the Hurricanes and Vancouver Canucks pushes to the playoffs respectively. These teams are trying to get into the postseason and will lean on players like Skinner and Vrabata. Kadri on the other hand, skates in Toronto for a Maple Leafs team that is 19-22-9 and struggling to stay relevant in the Atlantic Division. 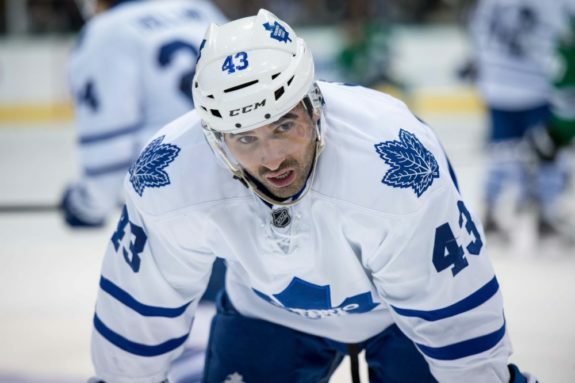 A bad stretch of hockey for the Maple Leafs, which is very likely, means a bad stretch of hockey for Kadri. Go with Skinner and Vrbata who are producing more and are overall more well-rounded and use Kadri as a last resort. For more fantasy news, check out THW’s fantasy homepage and follow Eric onTwitter at @_Roberts11.